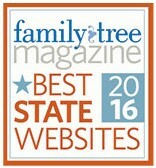 We are pleased to announce that the Indiana State Library (ISL) website was recently named to Family Tree Magazine’s list of “75 Best State Websites for Genealogy in 2016.” This list appears in the December 2016 issue of Family Tree Magazine and it can also be accessed for free here. The list honors the best websites specializing in genealogy research for each of the 50 United States. No matter where your ancestors lived within the United States, this list will be of immense help in tracing your American ancestors. ISL has subscription databases that can be accessed within the library, including, but not limited to Ancestry Library Edition, Fold3, Heritage Quest, NewspaperArchive and Newspapers.com. There is also a lengthy list of resources that can be accessed remotely. A few of those resources are: Hoosier State Chronicles, Indiana Biography Indexes, Marriage Indexes, Indiana Memory, World War II Servicemen, Indiana State Library Digital Collections and Indianapolis Newspaper Index, 1848-1991. Indiana has 92 counties and ISL has innumerable resources for each county. Resources could include vital records indices, marriage records, county histories, county maps, wills and probate records, city directories, newspapers on microfilm, court records, mortuary records, church records, tax records, cemeteries indices and census records. 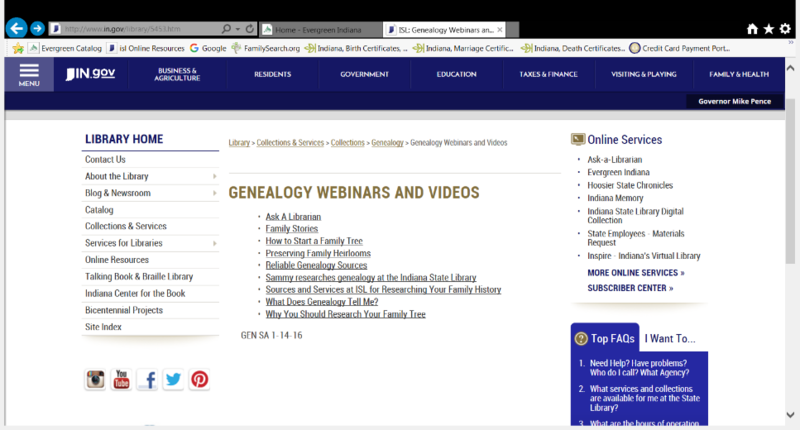 Be sure to check out the Genealogy Webinars and Videos webpage for further resources and tutorials. The best method for obtaining help with your family history research or finding answers to questions about the genealogy collection is through our Ask-A-Librarian service. 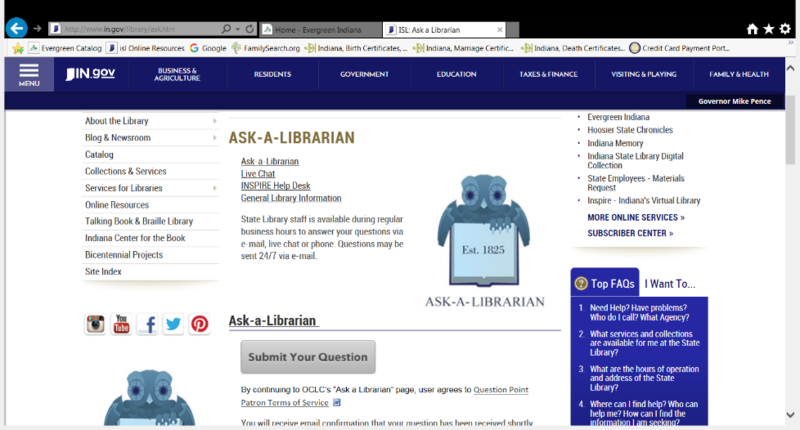 You can submit a question through this email service 24/7 and a librarian will get back to you within two business days. Patrons are also directed to look at the genealogy FAQ’s webpage for answers about the genealogy collection, about beginning genealogy research and miscellaneous genealogy questions. In addition, patrons have the ability to view the ISL’s Instagram pictures, YouTube videos, Facebook page, tweets and Pinterest boards, all accessible with one click on any ISL webpage. Just look for the social media icons. Who knows, you just might find a genealogy tip that will knock down your own brick wall! This blog post by Alice Winslow, librarian, Genealogy Division. For more information contact the Genealogy Division at (317) 232-3689.